Because logisticly fresh milk is not always possible, there is also a powder made of camel milk. 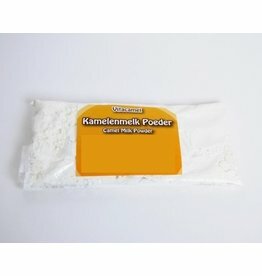 This powder is 100% pure camel milk. The powder is obtained by means of spray drying. Due to this way of processing, all the nutritional values ​​and characteristics of fresh camel milk is preserved. Milk powder is as healthy as fresh milk and easier to store. In a dry place, the powder has a shelf life of 1 year. The milk powder can be supplied in jars or bags of 420 grams, of which about 21 glasses of camel milk can be extracted from. Also, it is possible to order a test sample of 80 grams. Not everyone will like the taste of the camel milk powder, so you ad cocoa powder or a fresh vanilla bean. In our shop it is possible to order a fresh vanilla bean with camel milk powder. Instead of drinking of the camel milk, it is also possible to take capsules filled with milk powder. These capsules are made from HPMC capsules and filled with 100% pure camel milk from the camels of Camel Dairy Smits. For a noticeable effect it is recommended to take the capsules for at least three months, 2 to 3 capsules per day with a glass of water. The capsules have a two-year shelf life and must be kept dry. Do you have any questions? Please contact info@oasismilk.com.